Along with today's announcements of the Snapdragon 425, 435 and 625, we also see the reveal of a new wearables-oriented SoC: the Snapdragon Wear 2100. In the past we've seen vendors use low-end smartphone SoCs such as the Snapdragon 400 (Motorola Moto 360 2nd gen). In fact, to date only Samsung (Exynos 3250) and Apple (S1) were able to employ chipsets that were specifically designed for wearables. This was rather unfortunate for other wearable vendors as devices such as smartwatches require much higher efficiency and lower power than what "off-the-shelf" SoCs were able to offer. 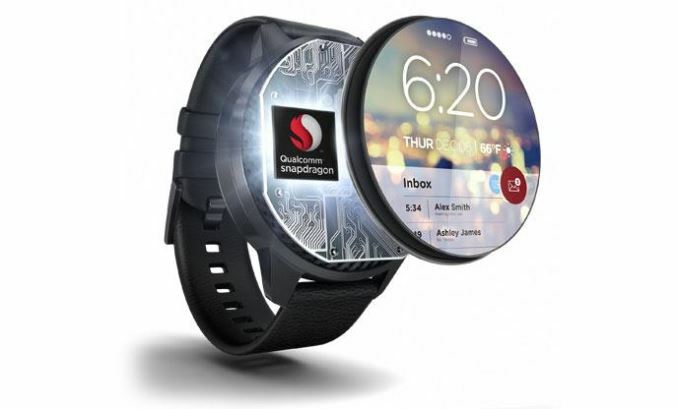 Qualcomm sees to fix this by introducing a new lineup of chips called Snapdragon Wear that are designed with wearables in mind. The Snapdragon Wear 2100 is a quad-core Cortex A7 running at up to 800MHz or 1.2GHz (Qualcomm at various points states both) with an Adreno 304 GPU and 400MHz LPDDR3. The choice of using a Cortex A7 is warranted by the fact that Cortex A53s are too power hungry for wearables and that it's likely too early to see Cortex A35 based SoCs as ARM announced the core only a couple of months ago. A big advantage that Qualcomm has with the Wear 2100 is that it's able to offer an integrated X5 modem for basic cellular connectivity (Supporting all current standards). With the Wear 2100 Qualcomm is now able to offer a fitting SoC for wearable devices and it's very likely that consumers will see direct benefits such as improved battery life. Qualcomm hasn't specified any availability for the SoC but discloses that there are multiple devices in development using the processor. "This was a rather unfortunate for" -> "This was rather unfortunate for"
"Qualcomm sees to fix this"??? Googling turned up a handful of references to multi-core Cortex-A5 chips.